Put up your feet, grab a good book, and spend an azure afternoon in a soft breeze and "Don't Worry, Beach Happy", it's as close as Summerwind 1204C. From the 12th floor, you share the sky with kites and pelicans while looking over the longest pier of the Gulf of Mexico. This unit offers a wrap-around balcony and windows that face both South and West for great sunsets. New to the rental market, this unit has several one-of-a-kind features including original local art in every room. The spacious kitchen has granite counter tops, recessed lighting, side-by-side fridge, new microwave and new dishwasher. With a expandable dining room table and new living room furniture, these rooms can comfortably seat everyone in your family. In addition, the living room features a queen sleeper sofa and wall mounted flatscreen. The master bedroom with queen bed features a continuous view of the Gulf, headboard hand-made from Navarre Pier reclaimed wood and a flatscreen TV. With a view of the Santa Rosa Sound, new furniture and flatscreen TV, the guest bedroom is equally comfortable. The third bedroom sleeps three with a new bunk bed and single twin, assuring your family has plenty of room. A full-sized washer and dryer is tucked off the main hallway. From white sandy beaches to crisp white linens, you've found Navarre's best kept secret in 1204C. My family and I loved EVERY minute of our vacation! Navarre is a beautiful place to stay. Our condo, 1204 C, was AMAZING! The staff was knowledgeable and kind. Thanks for making our stay so enjoyable! Great memories- very relaxing ! All of my contacts with, though few in number, were friendly and efficient. 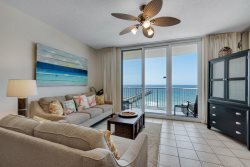 If you are interested in good location, accommodations, beautiful beach, and great food, Navarre is the place to be. The team members were very understanding of out situation and allowed my family member to check us out. The only issue we had was the freezer not working. The team was friendly and very helpful. I will definitively recommend to other people. The property was well equipped, clean, and user friendly. The pictures online didn't lie. It was everything I expected and more. Navarre Properties was fantastic as always. Helpful, courteous, professional. very clean, very modern, brightly decorated. One thing I wish we had was a crock pot.